Which GABAA Receptor Subunits Are Necessary for Tonic Inhibition in the Hippocampus? GABAA receptors (GABAARs) assembled of different subunits mediate tonic and phasic inhibition in hippocampal neurons. CA1/CA3 pyramidal cells (PCs) predominantly express α5 subunits whereas dentate gyrus granule cells (DGGCs) and molecular layer (ML) interneurons predominantly express δ subunits. Both α5- and δ-containing GABAARs mediate tonic inhibition. We have shown previously that mice lacking α5 subunits (Gabra5−/−) have a residual tonic current in CA1/CA3 PCs because of an upregulation of δ subunits, but the basis of the residual tonic current in DGGCs and ML interneurons of mice lacking the δ subunit (Gabrd−/−) is still unknown. We now show that wild-type DGGCs have a small tonic current mediated by α5 subunit-containing GABAARs responsible for ∼29% of the total tonic current. To better identify the GABAARs mediating tonic inhibition in hippocampal neurons, we generated mice lacking both α5 and δ subunits (Gabra5/Gabrd−/−). Recordings from CA1/CA3 PCs, DGGCs, and ML interneurons in these mice show an absence of tonic currents without compensatory changes in spontaneous IPSCs (sIPSCs), sEPSCs, and membrane resistance. The absence of tonic inhibition results in spontaneous gamma oscillations recordable in vitro in the CA3 pyramidal layer of these mice, which can be mimicked in wild-type mice by blocking α5 subunit-containing GABAARs with 50 nm L-655,708. In conclusion, depending on the cell type, the α5 and δ subunits are the principal GABAAR subunits responsible for mediating the lion's share of tonic inhibition in hippocampal neurons. Considerable kinetic and pharmacological differences exist between tonic and phasic inhibition mediated by perisynaptically and extrasynaptically located α5 and δ subunit-containing GABAARs and by GABAARs located at synapses respectively (Mody and Pearce, 2004; Farrant and Nusser, 2005). The δ subunit is present in the neocortex, thalamus, striatum, dentate gyrus granule cells (DGGCs) and cerebellar granule cells where it mediates tonic inhibition (Nusser et al., 1998; Pirker et al., 2000; Nusser and Mody, 2002; Stell et al., 2003). The α5 subunit mediates tonic inhibition in CA1/CA3 pyramidal cells (PCs) (Pirker et al., 2000; Caraiscos et al., 2004; Glykys and Mody, 2006; Serwanski et al., 2006). Previously, the α5-GABAARs were thought to be the sole mediators of tonic inhibition in hippocampal CA1/CA3 PCs, whereas the tonic inhibition of DGGCs was predominantly mediated by δ-GABAARs (Stell et al., 2003; Caraiscos et al., 2004). Yet, in the presence of 5 μm GABA, mice lacking α5 subunits (Gabra5−/−) showed a residual tonic inhibition in CA1/CA3 PCs mediated by an upregulation of δ subunits (Glykys and Mody, 2006), and mice lacking δ subunits (Gabrd−/−) expressed small residual tonic inhibitory currents in DGGC and molecular layer (ML) interneurons (Stell et al., 2003; Glykys et al., 2007) mediated by a yet unidentified GABAAR subunit. GABAARs containing ε subunits have been proposed to contribute to tonic inhibition in CA3 PCs through openings that do not always require the presence of an agonist (McCartney et al., 2007), and GABAARs formed solely of α and β subunits have been shown to mediate a small fraction of tonic inhibition in CA1 PCs (Mortensen and Smart, 2006). To determine the precise fractional contribution of the two principal GABAAR subunits (α5 and δ) to the tonic inhibition in hippocampal neurons, we generated α5 and δ GABAAR subunit double knock-out mice (Gabra5/Gabrd−/−). We demonstrate that α5 and δ are the main subunits responsible for tonic inhibition in CA1/CA3 PCs, DGGCs, and ML interneurons. Furthermore, a complete abolishment of tonic inhibition in CA3 PCs results in spontaneous gamma oscillations recordable in vitro. Adult (>35-d-old) male C57BL/6, Gabrd−/− (Jackson Laboratories, Bar Harbor, ME) and Gabra5−/− (original breeding pairs generously supplied by Merck, Sharp and Dohme, Harlow, UK) were used. Gabra5/Gabrd−/− double knock-out mice on C57BL/6 background were generated by cross-breeding Gabra5−/− and Gabrd−/− mice, bred and raised under the care of the University of California, Los Angeles (UCLA), Division of Laboratory Animal Medicine. PCR was performed on DNA isolated from tail samples of the different genotypes. PCR of Gabra5/Gabrd−/− samples were run twice in the presence of specific α5 and δ primers. Mice were anesthetized with halothane and decapitated according to a protocol approved by the UCLA Chancellor's Animal Research Committee. The brain was removed and placed in ice-cold artificial CSF (aCSF; used for cutting, incubating and recording) containing (in mm) 126 NaCl, 2.5 KCl, 2 CaCl2, 2 MgCl2, 1.25 NaH2PO4, 26 NaHCO3, and 10 d-glucose, with pH 7.3–7.4 when bubbled with 95% O2 and 5% CO2. Coronal and horizontal brain slices, 350-μm-thick, were cut with a Leica (Wetzlar, Germany) VT1000S Vibratome, in aCSF containing 3 mm kynurenic acid (Sigma, St. Louis, MO). Slices were placed into an interface holding chamber at 30 ± 1°C, and for some DGGC recordings, slices were kept in a submerged chamber. For whole-cell recordings, slices were transferred to a submerged recording chamber, and perfused (∼4–5 ml/min) at 32–34°C with 95% O2 and 5% CO2 saturated aCSF. CA1/CA3 PCs, DGGC and ML interneurons were visually identified by IR-DIC videomicroscopy (Olympus, Melville, NY; BX51WI, 40× water-immersion objective) and recorded with an Axopatch 200A amplifier (Molecular Devices, Sunnyvale, CA). For measurements of tonic inhibition, kynurenic acid (3 mm) and GABA (5 μm) were included in the aCSF. Microelectrodes (3–5 MΩ) contained the following internal solution (in mm): 140 CsCl, 1 MgCl2, 10 HEPES, 0.1 EGTA, 4 NaCl, 2 MgATP, 0.3 NaGTP, and 5 QX-314 (only for CA1/CA3 PCs), pH ∼7.27, ∼275 mOsm. Spontaneous EPSCs (sEPSCs)/sIPSCs were recorded with the following (in mm): 140 cesium-methylsulfonate, 10 HEPES, 0.2 EGTA, 5 NaCl, 2 MgATP, and 0.2 NaGTP, ∼271 mOsm, pH ∼7.29. Voltage ramps were measured with the following (in mm): 135 K-gluconate, 5 KCl, 10 HEPES, 2 MgCl2, 0.1 EGTA, 4 ATP-Na, and 0.3 GTP-Na. Series resistance and whole-cell capacitance were estimated and compensated to 70–80% (lag 7 μs). Recordings were discontinued if series resistance increased by >25%. Network activity was recorded in an interface chamber at 33–35°C using patch pipettes filled with aCSF connected to a differential amplifier (Model 3000; A-M Systems, Carlsborg, WA) with a high-pass filter at 0.1 Hz. All recordings were low-pass filtered at 3 kHz and digitized on-line at 10 Hz using a PCI-MIO 16E-4 data acquisition board (National Instruments, Austin, TX). Tonic current measurement was determined as described previously (Glykys and Mody, 2007). (1) The baseline mean current (Imean) was obtained by fitting a Gaussian to the all-points histogram over 1 s epochs (see Glykys and Mody, 2007). (2) Input resistance in CsCl-filled cells was calculated during the currents produced by seal tests. When K-gluconate was used, input resistance was estimated by the slope of a line fitted to the I/V plot obtained from a ramp protocol (−46 to −174 mV, 1 s). (3) sPSCs were detected in 30–60 s recording segments. Event frequency, 10–90% rise time (RT10–90), peak amplitude, and tau weighted (τw) values were measured. Detection and analysis were performed using a custom-written LabView-based software (EVAN). (4) For field potential analysis, the power spectral density was calculated for 3 min periods during control conditions and 10 min after drug application. Components caused by line noise were removed with a seven-point median filter, and the resulting power spectrum was used to determine the peak frequency and power area (V2) in the gamma-frequency band (30–80 Hz). The ratio between power in gamma- and ripple-frequency (150–250 Hz) bands was also determined (γ/rp). All data are shown as mean ± SEM. Statistical analysis was performed by Student's t test and one- and two-way ANOVA with Tukey honest significant difference or Dunnett's post hoc tests. Significance was set to p < 0.05. CA1 PCs express α5-GABAARs mainly at extrasynaptic sites, with low levels of δ subunit expression (Pirker et al., 2000). CA1 PC tonic inhibitory currents are not significantly altered by compounds known to potentiate δ-GABAARs (Stell et al., 2003; Wei et al., 2004), but the cellular components necessary to express functional δ-GABAAR are present (Glykys and Mody, 2006). To assess the component mediated by δ-GABAARs in these cells, we measured tonic inhibition after application of L-655,708, an α5-GABAAR-selective and high-affinity (Kd ∼2.5 nm) imidazo[1,5-α]benzodiazepine with antagonist (inverse benzodiazepine agonist) properties (Quirk et al., 1996). L-655,708 (50 nm) reduced the tonic current by 73% (p = 0.003, paired t test) (Fig. 1A, Table 2), and 200 nm had no additional effect (67% reduction, p = 0.004 paired t test; the residual currents were similar, p = 0.56 unpaired t test) (Table 2). It appears that α5-GABAARs contribute little to phasic currents as L-655,708 (50 nm) did not affect sIPSCs (CON, 16.4 ± 1.5 s−1, peak 36.8 ± 2.5 pA, RT10–90 0.57 ± 0.02 ms, τw 5.59 ± 0.11 ms; L-655,708, 17.7 ± 1.8 s−1, peak 35.3 ± 3.0 pA, RT10–90 0.58 ± 0.03 ms, τw 5.72 ± 0.11 ms; p > 0.05; paired t test, n = 6) or Imean (1 s epochs) (50 nm p = 0.52, 200 nm p = 0.82, paired t test) (Table 1). Thus, under our recording conditions, ∼30% of the tonic conductance in wild-type (WT) CA1 PCs is mediated by non-α5-GABAARs, most likely δ-GABAARs, although receptors composed of only α and β subunits cannot be excluded (Mortensen and Smart, 2006). GABAARs containing α5 or δ subunits mediate tonic inhibitory currents in hippocampal neurons. A, Whole-cell voltage-clamp recording of a CA1 PC (Vh = −70 mV). Top lines indicate the perfusion of L-655,708 and BMI. Right, Fit to the all-points histogram from segments of each of the three conditions. B, Whole-cell voltage-clamp recordings from Gabra 5/Gabrd−/− CA1 and CA3 PC, DGGC and a molecular layer interneuron (Vh = −70 mV). Right, Same as in A. In Gabrd−/− mice, perfusion of 50 nm L-655,708 reduced CA1 PC, tonic inhibition by 63% (n = 5; p < 0.001) (Table 2) suggesting that in these mice, some of the tonic inhibitory current is mediated by non-α5/non-δ-containing GABAARs, perhaps by receptors composed of only α and β subunits (Mortensen and Smart, 2006), or alternatively, by some α5-GABAARs insensitive to L-655,708. To address this, we cross-bred Gabra5−/− and Gabrd−/− mice to obtain animals lacking both α5- and δ-GABAARs (Gabra5/Gabrd−/−). CA1 PCs from Gabra5/Gabrd−/− mice in 3 mm kynurenic acid and 5 μm GABA showed a complete absence of tonic inhibitory conductance compared with WT mice (p < 0.0001) (Fig. 1B, 2, Table 2). The input resistance of Gabra5/Gabrd−/− CA1 PCs did not change after adding bicuculline (Table 3). Input resistance was also similar between WT and Gabra5/Gabrd−/− CA1 PCs when recorded in the presence of 0.5 μm TTX, 50 μm CdCl2, 3 mm kynurenic acid and 10 μm gabazine with K-gluconate internal solution (113 ± 10 MΩ, n = 8 vs 132 ± 16 MΩ, n = 7, respectively; p = 0.33, unpaired t test). The lack of tonic conductance in the absence of α5 and δ subunits is in sharp contrast to the condition when only one of the subunits is deleted (Fig. 2). With such a dramatic reduction of tonic inhibition, we wanted to determine whether compensatory changes might occur in sEPSCs or sIPSCs. Event frequencies and kinetics recorded from CA1 PCs in regular aCSF and low chloride internal solution were no different between WT and Gabra5/Gabrd−/− CA1 PCs (Table 1). Excitatory and inhibitory Imean (1 s epochs) were similar between WT and Gabra5/Gabrd−/− (p = 0.74; unpaired t test) (Table 1). Hippocampal neurons from Gabra5/Gabrd−/− mice show no tonic inhibitory currents. 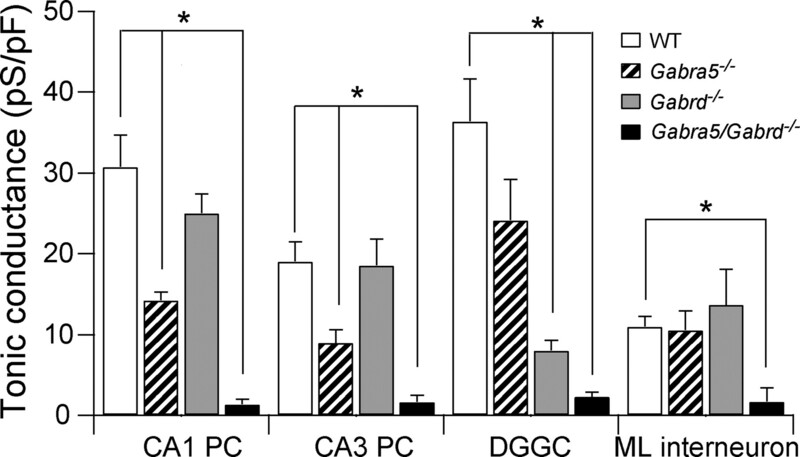 Mean tonic inhibitory conductance recorded from CA1/CA3 PCs, DGGCs and ML interneurons. One-way ANOVA of each cell type indicate statistical significance p < 0.05. Asterisk indicates Dunnett's post hoc test being statistically significant (p < 0.05) using WT as the control group. The number of cells recorded is indicated in Tables 1⇑–3. Tonic inhibitory currents were lacking in CA3 PCs of Gabra5/Gabrd−/− mice (p = 0.0001; unpaired t test) (Fig. 1A, 2, Table 2). Also, Gabra5/Gabrd−/− CA3 PCs input resistance did not change after addition of bicuculline (Table 3), and synaptic events did not show differences between the genotypes (Table 1). Thus, deletion of both α5 and δ subunits in CA1 and CA3 PCs produces a complete lack of tonic inhibitory current and no compensatory changes in phasic conductances. Apparently, neither subunit makes a functional contribution to currents generated at GABAergic synapses. A small residual tonic current remains in DGGCs of mice lacking δ subunits (Stell et al., 2003; Wei et al., 2004). This small residual current was reduced to noise levels after application of L-655,708 in Gabrd−/− DGGCs (Table 2) (p = 0.02, unpaired t test) suggesting that most, if not all, of this residual tonic current is mediated by α5-GABAARs. Tonic inhibition was also decreased when 50 nm L-655,708 was applied onto WT DGGCs (p = 0.01, paired t test) (Table 2) strongly suggesting that α5-GABAARs mediate a portion (∼29%) of the tonic current recorded in DGGCs, but this fraction could be an underestimate if some α5-GABAARs are insensitive to L-655,708. We turned to the Gabra5/Gabrd−/− mice to address this issue. Tonic inhibitory current was lacking in DGGCs of Gabra5/Gabrd−/− mice (p = 0.003, unpaired t test) (Fig. 1B, 2, Table 2). Input resistance of Gabra5/Gabrd−/− DGGCs was similar before and after bicuculline application (Table 3) (p = 0.83, paired t test). These results indicate that WT DGGCs express functional GABAARs containing the α5 subunit which contribute ∼29% of the total tonic inhibition. Moreover, assemblies containing the α5- and/or δ-GABAARs are the only ones mediating tonic current in DGGCs. sIPSCs and sEPSCs properties and Imean were not different between DGGCs of WT and Gabra5/Gabrd−/− mice (Tables 1⇑–3). Finally, the ML layer interneurons with a high expression of δ subunits also show a residual tonic current in Gabrd−/− mice (Glykys et al., 2007). Akin to the three other hippocampal cell types recorded in Gabra5/Gabrd−/− mice, ML interneurons lacked tonic inhibitory current (p = 0.002 unpaired t test) (Fig. 1B, 2, Table 1). Perfusing bicuculline did not change the input resistances of ML interneurons in Gabra5/Gabrd−/− mice (Table 2) (p = 0.56, paired t test). Together, these results indicate that α5- and δ-GABAARs mediate tonic inhibition in hippocampal neurons, and at least in adult animals, there is a complete lack of tonic inhibitory currents in their absence. We reported previously that mice lacking α5 subunits, but having a residual tonic inhibition, show signs of neuronal hyperexcitability in the CA3 region (Glykys and Mody, 2006). We wanted to determine the excitability in this region in Gabra5/Gabrd−/− mice where tonic inhibitory currents are entirely absent. In the presence of regular aCSF, extracellular field recordings from the CA3 pyramidal layer of hippocampal slices from Gabra5/Gabrd−/− mice showed spontaneous gamma oscillations (peak frequency, 43.7 ± 2.39 Hz; power in the γ-frequency band, 320 ± 93 μV2; γ/rp ratio, 7.65 ± 1.12; n = 7) (Fig. 3), although there was no evidence of spontaneous activity in field recordings from the CA1 pyramidal layer (n = 6). No spontaneous oscillations were observed in the CA3 of WT mice (power in the γ-frequency band, 86 ± 36 μV2; γ/rp ratio, 1.95 ± 0.36; n = 7), but after perfusion of 50 and 200 nm L-655,708, gamma oscillations emerged in extracellular recordings from the CA3 pyramidal layer (50 nm, 38.9 ± 4.14 Hz, 362 ± 151 μV2; γ/rp ratio, 5.34 ± 0.80; 200 nm, 39.8 ± 3.56 Hz, 715 ± 297 μV2; γ/rp ratio, 4.97 ± 0.70; n = 7) (Fig. 3). To confirm that the effects of L-655,708 on spontaneous activity in WT mice were caused specifically by antagonism of α5-GABAAR, 50 and 200 nm L-655,708 were also applied to four of seven slices from Gabra5/Gabrd−/− mice. To extract changes in the field potential that were specific to γ-frequencies, statistical analysis was performed on the ratio of the power area within the γ- and ripple-frequency bands. A two-way repeated measures ANOVA on changes in γ/rp ratio, with genotype as the factor and drug concentration as the repeated measure, showed a significant effect of genotype (F(1,9) = 11.74; p = 0.008) and a significant interaction between the effects of L-655,708 and genotype (F(2,18) = 6.41; p = 0.008), whereas the effect of L-655,708 was itself of only borderline significance (F(2,18) = 3.54; p = 0.05). Post hoc analysis of the differences between the genotypes at each concentration of L-655,708, using multiple-comparison t tests with Bonferroni correction, showed that the significant interaction observed could be explained by a significantly greater γ/rp ratio in Gabra5/Gabrd−/− versus WT mice in control conditions (t = 4.81; p = 0.032), which was not apparent after application of either 50 nm (t = 1.37; p = 0.641) or 200 nm L-655,708 (t = 1.79; p = 0.380). These results indicate that when tonic inhibitory currents are not present in CA3 PCs, spontaneous gamma oscillations are present. This can be induced in WT mice by blocking the α5-GABAARs with nanomolar concentration of its specific antagonist. Reducing tonic inhibition leads to the emergence of gamma oscillations in hippocampal CA3. Field potential recordings were obtained from the CA3 pyramidal layer of slices maintained in an interface chamber. A, The power spectral density of the field oscillation in control conditions and after cumulative application of 50 and 200 nm L-655,708 in WT (top) and Gabra5/Gabrd−/− (bottom) mice. Right, Sample traces notch-filtered at 60 Hz. B, Mean changes in log power in the gamma frequency range (30–80 Hz). C, Mean ratio of the power recorded in the gamma and ripple (150–250 Hz) frequency ranges (WT, n = 7; Gabra5/Gabrd−/−, n = 4). The main conclusions of our study are that (1) the GABAARs responsible for tonic inhibition in principal cells of the hippocampus as well as in ML interneurons contain the α5 and/or δ subunits. (2) Functionally, these two GABAAR subunits do not participate in phasic inhibition, and their absence does not result in compensatory alterations in phasic excitation/inhibition, or changes in input resistance. (3) A complete lack of GABAergic tonic conductance in CA3 PCs produces gamma oscillations recordable in vitro. Tonic inhibition is responsible for generating ∼75% of the total inhibitory charge received by hippocampal neurons (Mody and Pearce, 2004). This form of inhibition is mediated by GABAARs localized outside the synapses with kinetics and pharmacological properties that distinguish them from synaptic receptors (Farrant and Nusser, 2005). The δ-GABAARs are localized perisynaptically and extrasynaptically in the hippocampus (Wei et al., 2003) and are thought not to comprise γ subunit as the two subunits are mutually exclusive. The α5-GABAARs have a more restricted distribution in the brain, and the majority of these receptors mediate tonic inhibition particularly in hippocampal PCs (Glykys and Mody, 2006; Serwanski et al., 2006). When tonic inhibition is absent without compensatory changes in other GABAARs, as found in cerebellar granule cells of α6 knock-out mice, a conductance of equivalent magnitude is generated by TASK K+ channels (Brickley et al., 2001). No other conductance compensated for the missing tonically active GABAARs in Gabra5/Gabrd−/− hippocampal neurons because their input resistances in bicuculline were similar to those of WT neurons. As described previously, DGGCs as well as ML interneurons have a small residual tonic inhibitory current in δ knock-out mice (Stell et al., 2003; Glykys et al., 2007). Also, CA1 and CA3 PCs show a residual tonic current in the mice lacking α5 subunits (Glykys and Mody, 2006), suggesting that other subunits could mediate tonic inhibition in these neurons. The benzodiazepine inverse agonist L-655,708 selectively blocks α5-GABAARs at nanomolar concentrations (Quirk et al., 1996), and it has been used previously in high concentrations to block currents mediated through α5-GABAARs (Caraiscos et al., 2004; Scimemi et al., 2005). To avoid possible nonspecific effects on other non-α5-GABAARs we used concentrations as low as 50 nm to block α5 containing receptors and demonstrated that in WT CA1 PCs there is a small tonic inhibitory current mediated by receptors other that α5-GABAARs, as increasing the dose of L-655,708 (200 nm) did not have any further effects on the tonic current in CA1 PCs. This residual current may be mediated by δ-GABAARs, for which there is unfortunately no specific blocker, or by GABAARs containing only α and β subunits, as it has been shown in cultured rat hippocampal neurons (Mortensen and Smart, 2006). Instead of using various and complex pharmacological approaches, by recording from α5/δ double knock-out mice we show a complete lack of GABAergic tonic inhibition in CA1 and CA3 PCs indicating the need for no other types of GABAARs in mediating tonic inhibition. Although δ-GABAARs mediate a large fraction (>70%) of the tonic current in DGGCs, a residual L-655,708-sensitive current can be recorded in δ knock-out mice. The same amount of tonic current was blocked in WT DGGCs using L-655,708. Previously, the tonic currents recorded in DGGCs have been shown to be potentiated by diazepam, suggesting a participation of α5 subunits (Zhang et al., 2007), but probably not any other α subunits, as zolpidem does not potentiate DGGCs tonic current (Nusser and Mody, 2002). The participation of the α5-GABAARs in the tonic currents of WT DGGCs and the upregulation of these subunits in Gabrd−/− ML interneurons was clearly shown in recordings from Gabra5/Gabrd−/− mice, where both types of neuron lacked tonic currents. The α5 subunit has been shown previously to be expressed at synaptic sites, albeit at lower levels than found extrasynaptically (Serwanski et al., 2006). Interestingly, we failed to detect differences in fast sIPSCs of Gabra5−/− mice (Glykys and Mody, 2006) or in mice with both α5 and δ subunits deleted. In addition, blocking α5-GABAARs with L-655,708 did not alter phasic inhibition. As previously postulated (Glykys and Mody, 2006), our present findings are consistent with the idea that α5-GABAARs localized at the synapses are either not functional, or they exist in combinations with other α subunits that confer a different pharmacology to the receptor. Tonic inhibition has been postulated to have sizeable effects on the firing and excitability of individual neurons (Farrant and Nusser, 2005), but its effect on network activity has remained obscure. Here we show that the CA3 region of the hippocampus from Gabra5/Gabrd−/− mice displays spontaneous gamma oscillations in vitro, and that gamma oscillations can also be induced in slices from WT mice by low concentrations of L-605,788. It is known that tonic excitation of the hippocampal CA3, produced by agonists for muscarinic acetylcholine, kainate or metabotropic glutamate receptors, leads to the generation of persistent gamma oscillations in WT mice (Traub et al., 2004), and these results suggest that decreasing tonic inhibition can have similar effects on network activity. The fact that the reductions in tonic inhibition, produced by L-655,708 and the double knock-out of the α5 and δ subunits, were not associated with changes in phasic inhibition, is excellent evidence for the dampening role of tonic inhibition on network excitability. At this point we do not know much about the magnitude and pharmacological properties of tonic inhibition in various CA3 interneurons that are known to be recruited during these oscillations (Mann and Paulsen, 2007). Nevertheless, based on the distribution of α5 subunits, the interneurons are unlikely to possess such receptors (Pirker et al., 2000). Therefore, reducing the tonic inhibition of CA3 pyramidal cells alone, as with L-655,708 in WT slices, appears to be sufficient for generating the gamma frequency network oscillations. The prominent oscillations seen in the double knock-outs compared with the hyperexcitability without oscillations observed in Gabra5−/− mice (Glykys and Mody, 2006) indicates that a small amount of residual tonic inhibition is capable of stopping the conversion of network hyperexcitability into full-blown synchronous oscillations. Additional research is under way in the Gabra5/Gabrd−/− mice to address possible behavioral changes as well as the participation of these two GABAAR subunits in mediating tonic inhibition in other brain areas. This work was supported by the Gonda Fellowship (J.G. ), National Institutes of Health Grants NS30549 and NS35958, and the Coelho Endowment (I.M.). (2004) Tonic inhibition in mouse hippocampal CA1 pyramidal neurons is mediated by alpha5 subunit-containing gamma-aminobutyric acid type A receptors. Proc Natl Acad Sci USA 101:3662–3667. 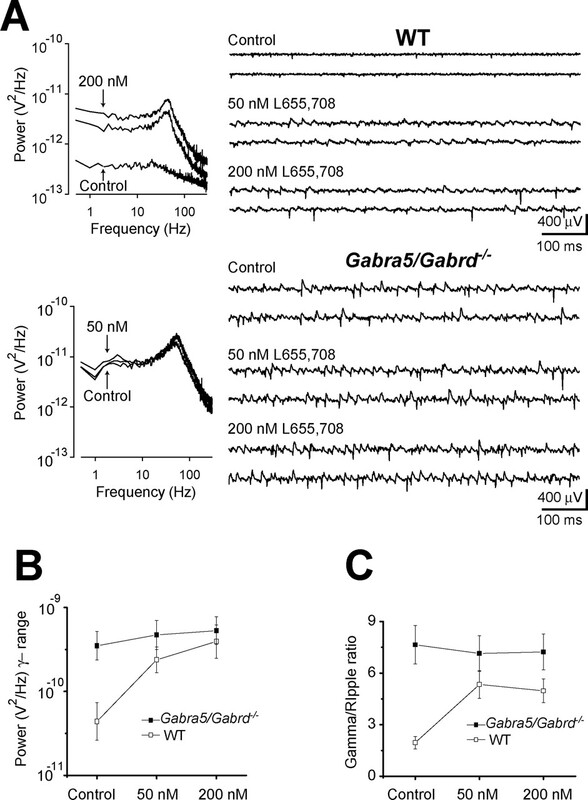 (2005) Variations on an inhibitory theme: phasic and tonic activation of GABAA receptors. Nat Rev Neurosci 6:215–229. (2006) Hippocampal network hyperactivity after selective reduction of tonic inhibition in GABAA receptor alpha5 subunit-deficient mice. J Neurophysiol 95:2796–2807. (2007) The main source of ambient GABA responsible for tonic inhibition in the mouse hippocampus. J Physiol (Lond) 582:1163–1178. (2007) A new naturally occurring GABAA receptor subunit partnership with high sensitivity to ethanol. Nat Neurosci 10:40–48. (2007) Role of GABAergic inhibition in hippocampal network oscillations. Trends Neurosci 30:343–349. (2004) Diversity of inhibitory neurotransmission through GABAA receptors. Trends Neurosci 27:569–575. (2006) Extrasynaptic αβ subunit GABAA receptors on rat hippocampal pyramidal neurons. J Physiol (Lond) 577:841–856. (2000) GABAA receptors: immunocytochemical distribution of 13 subunits in the adult rat brain. Neuroscience 101:815–850. (1996) [3H]L-655,708, a novel ligand selective for the benzodiazepine site of GABAA receptors which contain the alpha 5 subunit. Neuropharmacology 35:1331–1335. (2005) Multiple and plastic receptors mediate tonic GABAA receptor currents in the hippocampus. J Neurosci 25:10016–10024. (2006) Synaptic and nonsynaptic localization of GABAA receptors containing the alpha5 subunit in the rat brain. J Comp Neurol 499:458–470. (2003) Neuroactive steroids reduce neuronal excitability by selectively enhancing tonic inhibition mediated by delta subunit-containing GABAA receptors. Proc Natl Acad Sci USA 100:14439–14444. (2004) Cellular mechanisms of neuronal population oscillations in the hippocampus in vitro. Annu Rev Neurosci 27:247–278. (2004) Low ethanol concentrations selectively augment the tonic inhibition mediated by delta subunit-containing GABAA receptors in hippocampal neurons. J Neurosci 24:8379–8382. 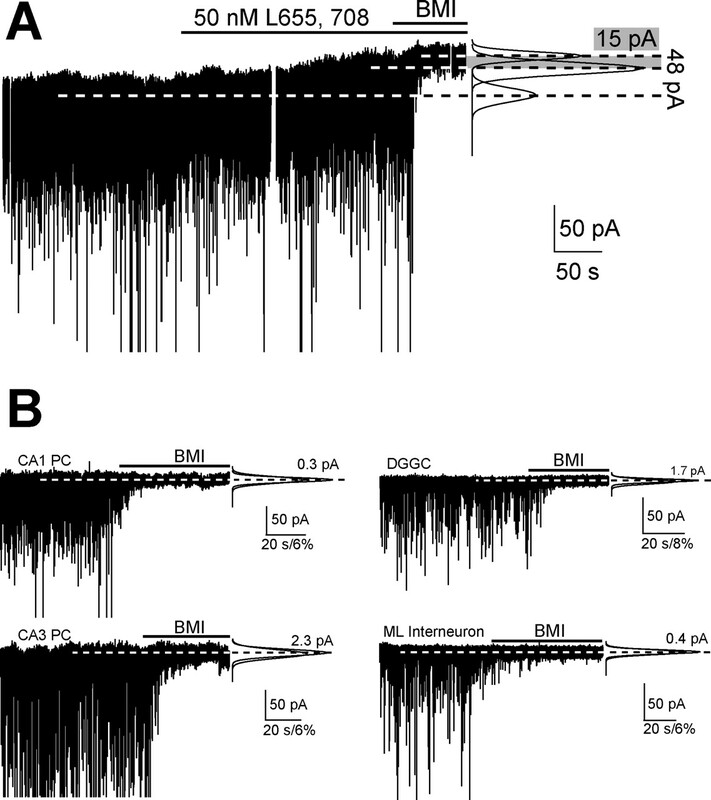 (2003) Perisynaptic localization of delta subunit-containing GABAA receptors and their activation by GABA spillover in the mouse dentate gyrus. J Neurosci 23:10650–10661. (2007) Altered localization of GABAA receptor subunits on dentate granule cell dendrites influences tonic and phasic inhibition in a mouse model of epilepsy. J Neurosci 27:7520–7531. You are going to email the following Which GABAA Receptor Subunits Are Necessary for Tonic Inhibition in the Hippocampus?